This year Mission First Tactical - MFT launched a lot of new products. Historically MFT has been consistent about releases of a small number of products. 2018 is apparently their year to leap forward with new magazine options, holsters, muzzle brakes and more. Let’s take a look at what MFT has brought to the market this year. 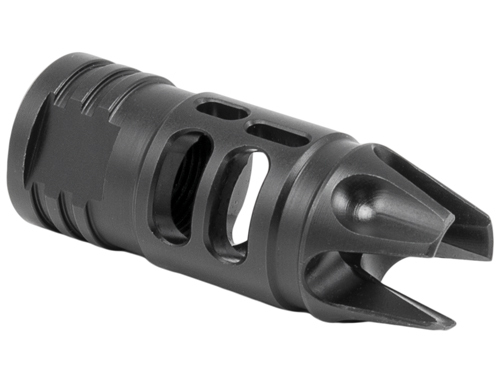 MFT Muzzle Devices - This year MFT introduced five different muzzle devices. After testing, my perspective is that they all are awesome. What I loved were all the models were very light, slim and compact. In a time when a lot of muzzle brakes are huge, heavy and load, MFT has taken a different route. According to MFT, these brakes all have a unique purpose based on the needs of the shooter. Some are designed to maximize braking and prevent muzzle rise but are louder for the shooter. Other models are designed to deliver the shooter a good braking muzzle device without the typical loud concussion. The E2ARMD3 Four Port Muzzle was my favorite and delivered a soft shooting controllable AR with a report similar to an A2 birdcage flash hider. All models are made from 416 stainless steel and black nitride coated with prices ranging from $34.99 - $99.99 depending on model. MFT Poly Drop-In Rail for AR15s and AK47s - With so many manufacturers still selling stripped down AR15s and AKs, MFT though it appropriate to offer a simple Drop-In Rail that any shooter could install themselves. The TEKKO Polymer AK47 and TEKKO MLOK AR15 rails install in minutes without tools and deliver the shooter a configurable platform they can easily attach accessories to. The TEKKO Rails are available in a variety of colors and are priced under $45. 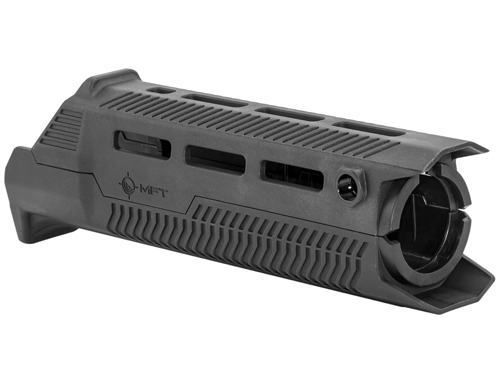 MFT EPG27 ENGAGE AR15 Grip - Almost every year MFT introduces another new grip. The new EPG27 offers some grip angle changes, and updated design, and a simple single finger ergonomic profile which MFT says improves shooter comfort and control during one-handed operations. The new grips are available in a variety of colors for around $20. MFT Magazines - MFT has made a number of tweaks and updates to their original magazine design over the years to assure total reliability. For 2018 MFT is offering 5 and 10-round short length magazines for hunters and capacity restricted states. MFT also is offering full length sized 10 and 15-round limited capacity mags as well that still fit in standard mag pouches. 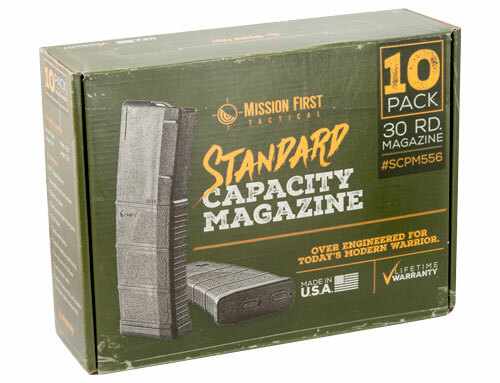 A unique idea is that MFT now offers 10 round magazine packs and 50-round magazine crates to make it easy for customers to bulk buy magazines. Clever and they also offer a bit of a discount in the process. See you local store for availability. 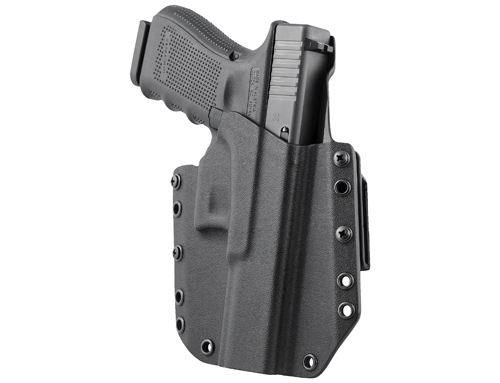 MFT Boltaron Holsters - Mission First Tactical’s new holster line is not just another me-too holster line. 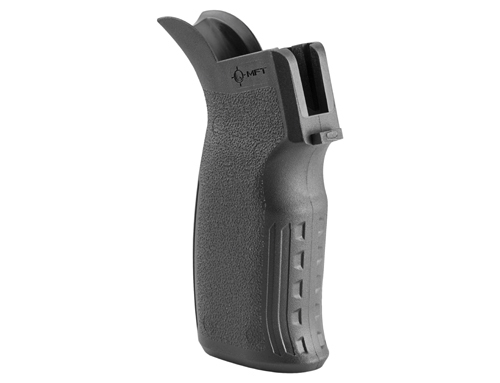 MFT’s OWB and IWB holsters were designed with high-tier adviser input, and precision molded from Boltaron; the tougher, more expensive and harder cousin of Kydex. MFT makes the gun molds from billet aluminum which have been CNC machined based on 3D scans of actual weapons. The result is a holster without distortion which is just as good as the one produced hundreds before it. Molding is completed via a specialized 24-zone heat and pressure vacuum thermoforming machine which controls every aspect of the molding process. The rivets are even precision machine controlled. The net of all this production attention manifests itself into a very premium holster for only $69. MFT’s OWB holsters are already on the market for most popular firearms, however the quite excellent MFT IWB I have been testing is coming soon. If you want a holster you can beat the hell out of this is one I would highly recommend. More from MFT - If you have not taken a good hard look at MFT, you should. They are one company which is making giant steps as an industry leader in tactical accessories.